While Niagara and the surrounding areas generally get the most fanfare here in Toronto, there is something to be said for the quality of the wine that comes out of Prince Edward County. According to the press release I got from Drink Inc, it turns out that PEC is the worlds fastest growing wine region. I am actually having trouble verifying the source of that but it is certainly growing at an incredible pace. I know we have certainly had some amazing wine from there and places like Norman Hardie are building a reputation for the region. There’s a reason the people behind Joe Beef are in love with them. 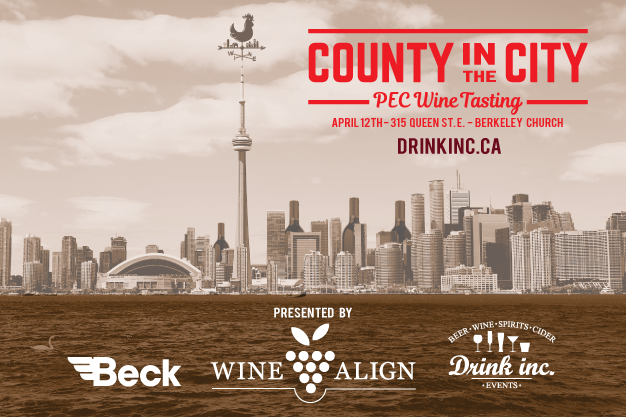 This Thursday (April 12) at 5pm, head over to Berkeley Church and take the chance to sample from some 20+ wine makers from the region at County in the City. This is a pay once and sample all night event, so no worrying about tickets and the like. One main draw is that much of the wine you’ll sample is NOT available via the LCBO but you’ll be able to purchase bottles on the spot to get shipped right to your door. We went last year and had an absolute blast – there was an amazing range of wines to sample and we fell in love with quite a few of them. Along with the wine there will be food to pair with it and live music to enjoy. Last year It actually inspired a road trip that inspired this review. The price is $60 at the door but if you buy ahead of time it’s only $49. Includes all the wine samples along with some food. Founder of Toronto Booze Hound. He can be seen drinking almost anything in the wild from beer to rum. Try not to startle him, he may use humour as a self defence method. © 2019 Toronto Booze Hound.